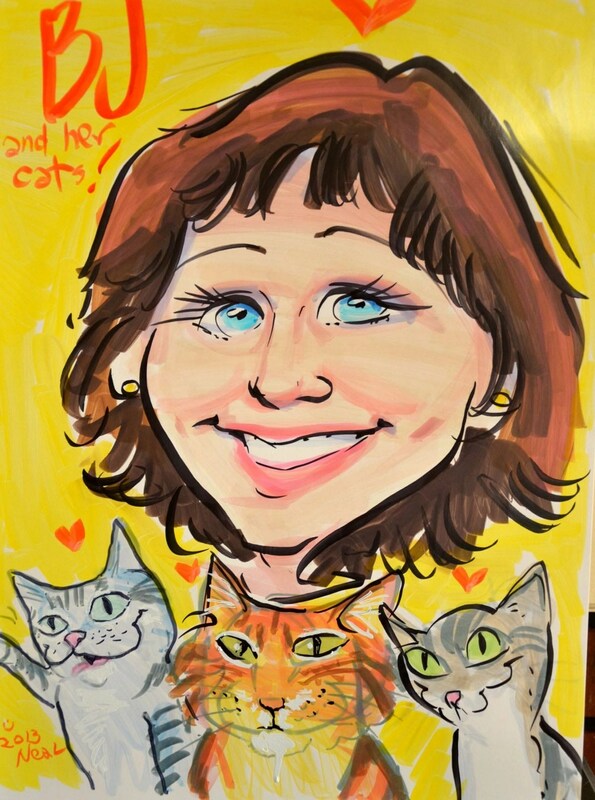 Hart of Maine, the Homeless Animal Rescue Team, has a big heart, taking care of cats that would otherwise be out on the street. 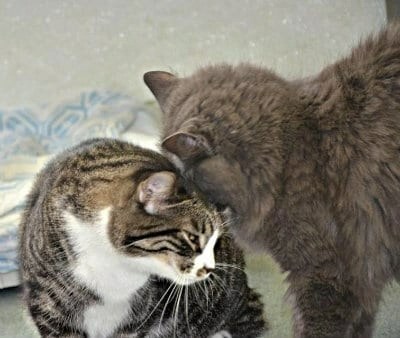 Located in Cumberland, the facility keeps a low profile, not wanting people to dump felines at their front door, but they are well known as a 100 percent all volunteer organization that gives its all to help cats. 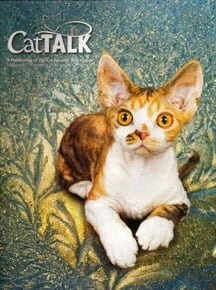 That includes cats with diabetes, FIV, Feline AIDS, and other less known diseases. There’s even an entire room devoted to feral cats, with some 20 or so kitties having lots of room to roam, all the way from the floor to the ceiling and places in between. The no-kill cat adoption center and shelter has a sort of new age feel, with no cat – unless recovering from surgery or illness, kept in cages. There are a series of six cat rooms, where the felines can frolic, jump, play, hide and bond with other cats in the room. Volunteers, adopters, and visitors have a chance to really see the cats in action, and get a real feel for how they interact with other cats and humans. There’s plenty of room for the cats. From the time, one enters the front door, they are greeted with the lobby cats. There’s a huge adoption tree on the side wall, something all shelters might want to consider. The branches have red, green and pink leaves. Red means kittens, green, adults’ and pink means cats with FIV, cat aids. It’s a misnomer to think FIV is spread through saliva. It’s actually spread through the blood. These felines don’t need a special diet. But it is recommended they not be brought into households with other cats. The first room on the left finds lots of ferals, some shyer than others. There’s plenty of room for them to hide when a scary human comes in to feed them. There are litter boxes galore, and the rooms are cleaned daily. 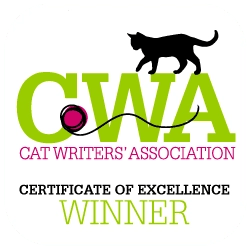 The cats seemed to be getting along just fine – probably because they’ve all been spay/neutered, preventing the tendency to fight over their sought-after mates. The ferals also know food will always be there, and that changes the personality of the cat. 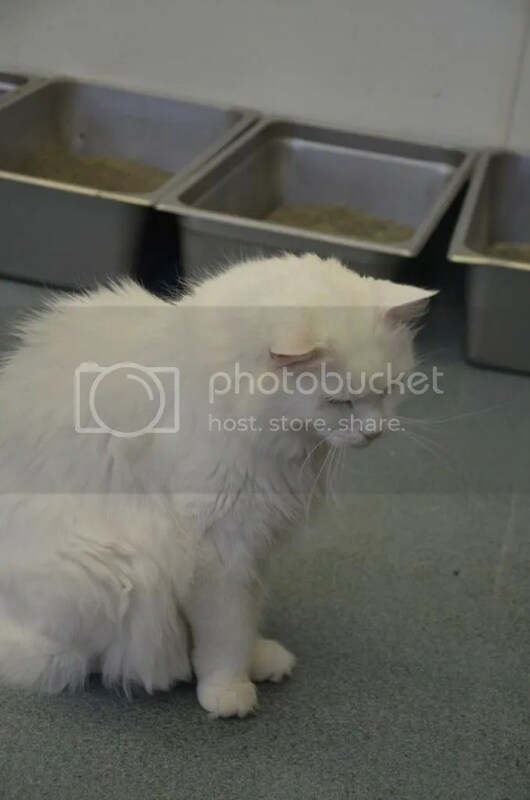 Here we find a senior Turkish Angora, senior, who is totally overwhelmed and cage aggressive. The volunteer staff tells us, “This is a quiet place.” There’s another senior orange tabby Chandler, and one-year-old Cooper. Four or five of these cats are true ferals. The others are skittish and need quiet. Some have come from Friends of Feral Felines (FoFF) through their trap, neuter, return program of local cat colonies. Some have been there since HART’s beginning, when they were located in a barn. In 2004, a state of the art new building was constructed. The ferals moved from the barn to the new location, with several rooms, designated for specific personalities and mannerisms. HART was founded in 1997 by Eileen Smith. She renovated a barn on her property in Cumberland to establish the shelter and, over time, volunteers joined to help her with the animals. In April, 1999, Smith relocated out-of-state, but she allowed HART to continue operating the shelter from her property. After her departure, HART’s volunteers took on the responsibility of running the shelter and we officially reorganized, becoming a 501(c)(3) non-profit corporation. 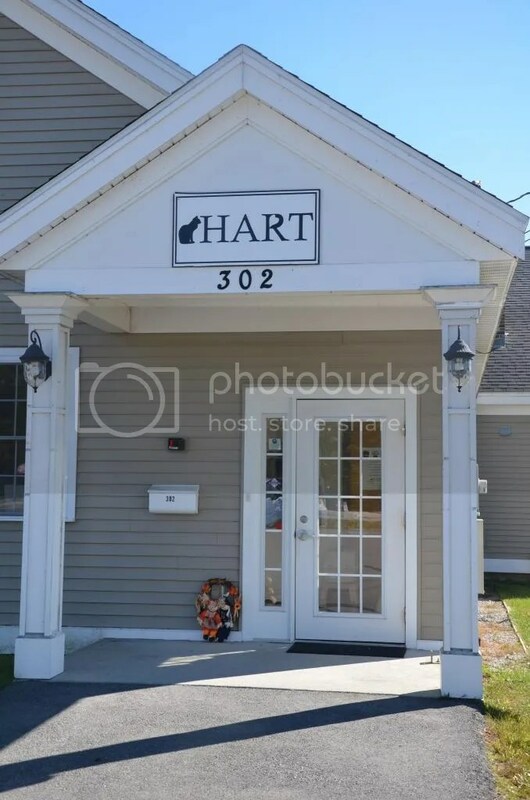 Today HART is a respected private shelter and adoption center licensed by the state of Maine. Cats come to HART by ways that cats come to all shelters. They come from owner surrenders, state seizures. However, there’s one big difference – Once a HART cat, Always a HART cat. If an adoptee cannot keep a HART cat, that person can bring him back to HART, even if it’s been over ten years, since the initial adoption. If two cats come in as a pair, they try to adopt them out as a pair, so they can stay together. The only exception is if they don’t get along or are not bonded to one another. In Room 2, the Diabetic Kitty Room, Linus is crated because his food needs to be monitored to balance out his sugar levels. There’s Gardia and Pumkin; the black kitty, Denny, the gray cat Melody, and Trouble, the original sugar cat that has been at HART quite awhile. Most of the rooms have names for easy identification. And all the cats have names, as well. No kill, cat -only shelter is 100 percent, all volunteer, with no paid staff. There are 80 volunteers that do everything from cleaning to fundraising, appeals/newsletter writing, brushing the cats, and socializing them. Various volunteers are able to make different commitments at various times. Erin Cully, has been giving HART shelter tours for four years. In college, she needed to perform community service while working towards her journalism degree. She now works full-time in IT (information technology) and volunteers off and on for HART. She wrote an article for HART as a school project, interviewing kids, when the shelter was in the barn. She kept in contact with the volunteers and came back to it. They try not to house more than 120 cats. They’ve been at 130 since 2010. “We were really hart hit by the housing crash a few years ago,” Cully said. “There was a real influx of cats. People lost their homes. They couldn’t care for their families or their animals.” After that, HART instituted a policy of no more surrenders. “That’s difficult to tell people,” she said. In 2010, the adoption rates were way down. In 2012, the adoptions were on the upswing. Because they are no-kill, they have cats from Eastern Maine and out-of-state. “They call us instead of other shelters,” she said. While other shelters can give cats away at no cost, HART cannot, she said. Many have funding from other sources. HART is all volunteer. There are no contracted city and town services. , give away for free. They have funding from other sources. However, they do offer specials at the Cumberland Fair, which helps out with the adoptions and the donations. The Maine Room is much bigger than some of the other rooms. Here we find HART’s only shelter cat, Cheetoes, who came there when he was a kitten in November of 2008. The three-month-old kitty had spinal biffetta. Both his back legs are paralyzed and he is incontinent. It wouldn’t be fair for him to re-adjust to new surroundings, Cully said. Fletcher, a black cat, is kind of semi-feral. Louie, was hit by a car. He has no tail and a few incontinent issues, as well. He has great night vision. You can just see the glow in his eyes. A huge window connects this area with an adjacent area, creating an allure of one big room with lots of kitties. Sweet Room is a quiet room with some very shy kitties there. Some of them have been there since the barn, but thankfully Cully said those numbers are dwindling. There’s now less than 10. They have been able to get rid of the isolation room, and a year ago last winter, put in a new air exchange system. The clean rooms and the better air exchange have aided in keeping the cats healthy. “It’s easier to determine their personality when you can see them playing, pick them up, and see them in a more normal environment. HART keeps a low profile when it comes to its physical location. In 2008, several cats were abandoned at our door. That’s why we don’t have an obvious signage. We don’t want people just dropping cats off at the door. There’s the good and bad of that. It deters people from dumping cats, but it also makes it hard for volunteers and donors to find HART. But once they do, they’re hooked. Paws mummy wished she had found it when she lived in southern Maine because she would have really been able to connect with a great shelter. C Click here to check out Paws for Reflection’s slideshow of photos from HART. There’s no doubt HART could serve as a model for sheltering. The model attracts both volunteers and donations, while facilitating an open room environmental for the cats. The shelter operates 100 percent volunteer – that includes the executive director. There is no paid staff. How do you think this model could be implemented in your area? Please share your thoughts.